Chat readings are billed from $3.07/minute so you only pay for what you use. *T&Cs - This offer is open to new customers who are registered in the US. 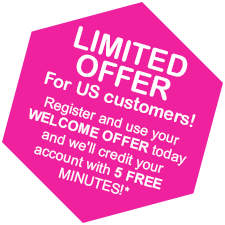 The free five minutes will normally be credited to your TheCircle account within 48 hours of using the Welcome Offer (currently 10 minutes for $5.90) and must be used within 28 days. We reserve the right to remove this offer for customers we believe are acting fraudulently.